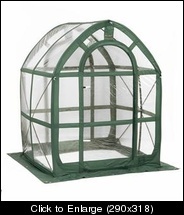 I am going to get a 5'x5'x6' pop-up greenhouse from FlowerHouse. The only trouble I'm having is that I can't find a greenhouse heater to heat such a small area. Any suggestions? My budget is like 50 dollars. I thought that I could just get a little electric heater/fan and stick it in, but what do you guys think?